Operation Stack, which sees lorries parked on the M20 to avoid congestion at Dover, should be replaced by a proper lorry park, says a council boss. Paul Watkins, leader of Dover District Council, says the present situation is causing financial hardship for the people of east Kent and cannot go on. 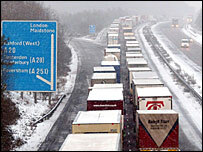 When Operation Stack is implemented, lorries are kept on the M20 and other traffic diverted onto minor roads. It has been brought in several times this year, most recently this week. Among the causes of repeated congestion in the past month have been the snow of early March, a strike in France and damage to a berth at Calais which has limited the number of ferries which can cross the Channel. Mr Watkins said a proper lorry park should be built which lorries can be moved into, leaving the motorway clear for the other traffic, which is otherwise moved onto minor roads leading to the port.